Does the Insanity® workout really work? This is perhaps the most intense workout on the market today. It, along with P90X, has been put into the extreme fitness category. In my preceding post, I explored the positives of the Insanity workout. This post is dedicated to the precautions to be taken when participating in this style of workout. Insanity is an innovative workout, using high-intensity exercise and body-weight moves to give a total body conditioning. However, some of the moves may be too advanced for the general public. As a former NCAA Track and Field athlete, I enjoy Insanity. It reminds me of the drills and training I experienced as an elite competitor. However, if you do not have a background in sports, have orthopedic limitations, or are beginning exercise after being sedentary, this program might be too intense starting out. Extreme exercise can cause unexpected results, including sprains, pulled muscles, and even broken bones. The Insanity program is designed for people who are already in shape. Unconditioned exercisers can participate if they take it slow and pace themselves. Get help from your corporate wellness center staff to learn safe approaches to the program. Don’t feel discouraged if at first you can’t keep up. In fact, if you take your focus off of Shaun T and watch the extras in the back, you will notice they have a tough time keeping up, too. Know your limits and gradually build up to your ability to begin and finish Insanity. DIG DEEP! This is the encouraging motto of the Insanity® fitness DVD workout that is captivating the fitness world. This DVD set showcases the workout that was featured on the Dr. Oz show. All types of exercisers, from former athletes to soccer moms, are taking the challenge. It promises to burn fat and give you the toned look of a beach body. With this workout's allure, you are probably curious to know if it's the workout for you. This post is dedicated to the pros of the Insanity series. See part 2 for the cautions to be considered for this type of training. The exercises require little or no equipment. Many are body-weight exercises that require little space to perform. It includes a variety of specific workouts, which allows you to change the workout from week to week. You receive a nutritional guide that emphasizes the importance of consuming the right amount of calories to sustain an intense workout regimen. If you are well conditioned, this style of exercise can be very effective. 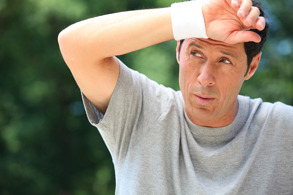 However there are some concerns of injury associated with intense exercise. Read “Corporate Fitness Review: Insanity® (Part 2: Cons)” to learn how you can make the workout a bit saner.